1 of 5 Heat oven to 300 degrees F. Spray two baking sheets with nonstick cooking spray. 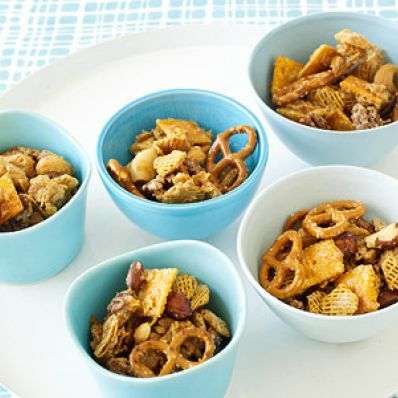 2 of 5 In a large bowl, mix together the cereal, pecans, mixed nuts, pretzels and cheese crackers. Set aside. 3 of 5 In a medium-size saucepan, melt the butter over medium-low heat. Stir in the corn syrup and brown sugar. Cook mixture for 5 minutes, stirring continuously. Take off heat and stir in the baking soda and cream of tartar. 4 of 5 Carefully pour hot mixture over cereal, stirring with a wooden spoon to coat all ingredients. Divide mixture evenly over both baking sheets. Bake at 300 degrees F for 15 minutes, stirring twice. 5 of 5 Let mixture cool on baking sheets and break apart. Store in plastic bags or sealed containers.